Elections must be declared null and void for Pakistan to come on track. Humayun Gauhar, a veteran columnist in Pakistan and editor of Blue Chip magazine. Those who say that the protestors are derailing democracy are too ignorant to understand that Pakistan has never had democracy, only a charade of it. Article 218(3) of the Constitution of the (not so) ‘Islamic’ Republic of Pakistan states: “It shall be the duty of the Election Commission to organise and conduct the election and to make such arrangements as are necessary to ensure that the election is conducted honestly, justly, fairly and in accordance with law, and that corrupt practices are guarded against”. The Election Commission’s overdue post-election report is damning. This is the evidence you need to know that the May 11, 2013 general elections were rigged, not least because they met none of these constitutional criteria of honesty, justice, fairness and lawfulness. Now we have found the fire behind the smoke. This report is the proverbial smoking gun’ we were looking for. ‘His Highness’ Nawaz Sharif, as the UN mistakenly called him, unwittingly but correctly reflects the man’s mindset. Now ‘His Highness’ – ‘The Man Who Would Be King’ – doesn’t have a toe to stand on, leave alone a leg. His legal and moral authority stands completely eroded, yet he hangs in there like a dictator whose legitimacy hangs by the flimsy thread of a Supreme Court judgment well after his ‘sell-by’ date. Like a dictator, he fears that if he resigns the demons will come visiting and he will have to undergo ruthless accountability. Not good for government in the short-term but very good for our political evolution in the medium-term as people keep learning the hard way and hopefully don’t make such mistakes again of following poor leaderships. The longer it takes the messier will Nawaz Sharif’s exit be. So there you have it, the smoking gun. 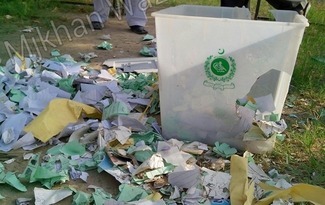 Any degree of “incompetence or lack of training” forsooth, it was the ECP’s constitutional duty to overcome these eminently solvable problems and ensure that “the election is conducted honestly, justly, fairly and in accordance with law, and that corrupt practices are guarded against.” It failed signally. Why it did and how and what was the quantum of rigging and what the degree of lack of training and incompetence and who did it can be investigated and corrected later, but the May 11, 2013 elections should be declared null and void, electoral reforms conducted and elections held again after a population census five years overdue. Without a census and the updating of electoral rolls, the delimitation of constituencies and, if necessary, an increase in the number of seats in the national and provincial assemblies any new elections will also remain wanting. After Nawaz has gone, today’s slogan “Go Nawaz Go” should become “Accountability Before Elections, Reforms Before Elections” – ‘Pehlay ethisab, phir intikhab’ and ‘Pehlay Islahat, phir intikhab’. That has to be the logical conclusion. The fact is that Pakistan is further away from democracy than it ever has been. “Go Nawaz Go” conversely means “Come Democracy Come” for the first time ever. Add this ECP admission to the government’s admission in the national assembly by its interior minister’s officially un-contradicted statement that 60-70,000 votes cannot be verified in any constituency and it is double certainty that elections were hugely rigged. Now you have a double-barrelled smoking gun. What more do you need? What are you waiting for? Some judicial commission to ‘prove’ that the ballot was rigged? What price a judicial commission when the then chief justice Iftikhar Chaudhry with some retired judges and the judiciary’s returning officers in each constituency are accused of allegedly rigging elections? This is the chance for the Supreme Court to redeem its honour by taking suo motu notice of the ECP report and order the dissolution of the national and provincial assembles forthwith, fresh elections under a caretaker government and a reconstituted ECP comprising acceptable people who first and foremost are “sagacious, righteous, non-profligate, honest and ameen [trustworthy]…” before they can determine whether any electoral candidate meets these criteria as required by Articles 62 and 63 of the Constitution. All that is needed are “a few good men” and we can bring a 180-degree turn in Pakistan’s direction from the nadir to the zenith. Don’t tell me that Pakistan is bereft a few good men? There are ample, but our anti-democracy political system doesn’t let them emerge. To come to the surface they must have oodles of illegal wealth, lack of morality, be liars and have the ability to rig elections. If the Supreme Court fails to discharge this duty, we will have bloody anarchy because the army quite correctly seems to be in no mood to intervene. Let the politicians and judiciary sort out their mess. However, if it comes to saving the state it will act for that is what it is sworn to do. The judges will then be racing to take oath under another provisional constitutional order and everyone will be casting their nets wide to find some connection to General Raheel Sharif – “his wife’s cousin was in school with my wife’s sister” and crap like that, looking to cultivate his friends and underlings. Don’t bleat then that you didn’t bring it upon itself. Nawaz Sharif was party to the rigging because he was petrified of Imran Khan even before the elections. Once other parties saw what was happening, they too rigged the polls in their turfs. They overdid it. The die was cast. Not just Imran Khan rebelled, but every other party including Nawaz’s PML-N complained about wholesale rigging. Had Nawaz Sharif agreed to audit votes in four constituencies that Imran Khan initially demanded, this gridlock could well have been avoided. Imran went to every judicial forum available and was spurned. Finally he decided to lead a march to Islamabad and start adharna in what the government has questionably designated the ‘Red Zone’ opposite state buildings until Nawaz Sharif’s resignation as prime minister. Ditto Dr Tahirul Qadri. Qadri’s imminent return to do exactly what Imran was threatening and on the same dates made Gang Sharif even more fearful and witless. Morbid fear made them irrational. What followed made things worse: the Lahore massacre, hijacking of Qadri’s plane, blocking roads in Lahore, Islamabad and on the Grand Trunk Road, attacking Imran’s procession in Gujranwala, but the two marches got to Islamabad anyway, demonstrating the will of the people. When the people rise like a tidal wave there is no power on earth that can stop them. If the Grand Trunk Road could speak what tales it would have to tell, starting from the incredible Sher Shah Suri who built it, the first motorway in the world from Khyber to Calcutta, the greatest ruler our subcontinent has ever had. He also laid the foundation of the postal and revenue services and the mapping of India and gave land titles and for which the Mughals are wrongly credit by amateur historians. The Mughals only built upon these reforms as later the British did. What the Mughals were good at was pomp and panoply, building mosques, mausoleums and gardens, beautiful no doubt but they did precious little for the people. For those of you who imagine that the majority of the people of this subcontinent have ever known a decent living, the news is that they never have. Hopefully it will start now, but at the rate that we multiply like rabbits procreating ourselves to death, don’t get too excited. Good Lord. Where did I start and where have I gone? The dharnas have been going on since August 13. That’s a long time for anyone to still believe that this is not serious, that people have been misled and paid to come or there are ‘hidden hands’ behind them under the usual ‘London Plan’. Why give so much importance to a meeting? Would you call it the ‘London Plan’ when the name ‘Pakistan’ was announced in London’s Waldorf Hotel last century, and the five people involved conspirators? Denial only harms you, not the one you are denying. As Jesus said: “God, forgive them for they know not what they do” – or words to that effect. Imran’s Plan-B has started unfolding. Qadri’s will soon. Imran is holding massive rallies in every major city and returning to Islamabad. They have shaken the government to its core. Some energy. I always wonder: Imran is only a couple of years younger than me, how does he do it? It is energy born of commitment, strong faith, incredible determination, un-purchaseability, courage, and above all belief that he is a man of destiny. Such people are not easily beaten, something that a businessman like Nawaz Sharif cannot understand because he believes that everyone and everything has a price tag. Thus he is facing Imran’s bouncers whistling past his nose at 90 mph. For how long can he duck and weave? Nawaz may hang in there for a time, the protestors may go home but the movement will continue and reach its logical conclusion. The only way he can get out in one piece is by resigning or joining Imran Khan’s party, which would be quite a sight. The King leading the revolution against himself, what? Impossible, given the huge egos involved. Ah, democracy. Those who say that the protestors are derailing democracy are too ignorant to understand that Pakistan has never had democracy, only a charade of it. The people’s success will usher democracy for the first time in this benighted country. Revolution, a much-abused word because it is least understood, has actually started. When you have the rich demonstrating for the rights of the poor, that is a mental revolution of an awesome kind. Democracy and revolution are work in progress, work that never stops, always evolves.